And then I answered: I wasn’t feeling it. Notre Dame had taken several big shots from the third-ranked Cavs, who led 16-6 eight minutes in, then after getting down eight had rallied in the second half to take the lead briefly. Pat Connaughton, on his way to a 21-point night, couldn’t miss. The Irish were getting every offensive rebound (finishing with 16, leading to 20 second-chance points). Virginia, for its part, was sort of limping along. Stars Justin Anderson and Malcolm Brogdon combined for three points in the first half, and the offense was stagnant all night long (just nine assists on 25 made baskets). We know now how it turned out. Virginia went on a 9-0 run over a 3:58 stretch to blow open a tie game en route to posting the 62-56 win. Notre Dame had won its last five home games against Top 10 teams, a remarkable stat, to say the least. And everything seemed to be pointing to the Irish making it six. Jerian Grant, the team’s leading scorer coming in at 17.3 points per game, hit just his second shot from the field with 4:00 to go to tie the game at 53, moments after a Brogdon three had seemed to give UVA important momentum. And that was it for Notre Dame until a meaningless three with 1.7 seconds to go by Demetrius Jackson. Five straight stops for the Virginia defense, aided by a key miss on the front end of a one-and-one by Grant with 1:03 to go. The Irish went 0-for-4 from the field with a turnover and the missed free throw in the stretch. Virginia wasn’t exactly an offensive juggernaut in its own right. After an Anderson three made it 56-53 UVA with 3:48 left, the ‘Hoos went scoreless themselves until a driving layup by Brogdon with 1:12 to go pushed the lead to five. The Cavs, of late winning with their surprisingly high-octane offense, at least in terms of points per possession, won this one in a familiar way, with their defense. Notre Dame, which had been averaging 85 points per game and shooting 55 percent from the field coming in, shot 33.9 percent on Saturday, and after a 5-of-9 effort from long-range keyed their 27-24 halftime advantage, the Irish connected on just 5-of-15 from three in the second half, including the throwaway three in the final seconds. Also familiar was who stepped up in the final minutes: Anderson and Brogdon, who combined for 21 points on 7-of-9 shooting from the field in the second half after their miserable first halves. Brogdon gets bonus points for his shutdown effort on Grant, who scored six points on 2-of-8 shooting from the field in 38 minutes. And give some credit to a guy playing a familiar role: Darion Atkins. Atkins, reminiscent of Akil Mitchell, had a quiet, but deadly, 14 points on 7-of-11 shooting to go with a team-high eight rebounds, on a night when Anthony Gill (four points, two rebounds in just 15 minutes) was eerily silent in all respects. This game had upset written all over it, if it could have even been rightly called an upset, considering that Notre Dame came in 15-1 on an 11-game winning streak with the aforementioned track record beating Top 10 teams on its home court. 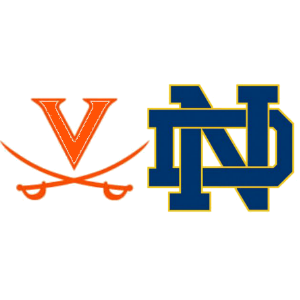 Virginia won tactically by getting Notre Dame to play its tempo, then asserted control when it is accustomed to doing so, late and with a vengeance.